Week 21 – Are you sneaky or Selfish? I’m live on the radio on Monday (5/19) at 5pm ET/2pm PT and I’ll be joined by Jessica Ortner, author of “The Tapping Solution for Weight Loss and Body Confidence.” We’ll be tapping and taking your calls at (866) 254-1579. You can listen at HayHouseRadio.com. Have a lazy week . 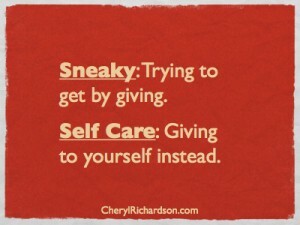 Are you sneaky or Selfish? I don’t want to do a damn thing. There’s laundry to be done, emails to answer, house projects calling my name. So many things begging for my attention. But they won’t get it. Because today I’m being Selfish. I’m keeping my attention for me. For years I thought the way to get the attention I needed was to give it to everyone and everything else first. Maybe then I’d get some back. But what you get back is never enough when you keep ignoring yourself. Not to mention the fact that it’s sneaky to try and get by giving. And I was masterful at being sneaky. And it works so much better for everyone. Here’s a delightful video for a lazy day. You can watch it here. Thanks, Barbara!